Comment Avatar - James Cameron's 3D-enhanced sci-fi CGI space-western movie - is set to be a stunning success, and the storage industry is jumping on the bandwagon carrying its 10 feet tall, blue-skinned aliens. 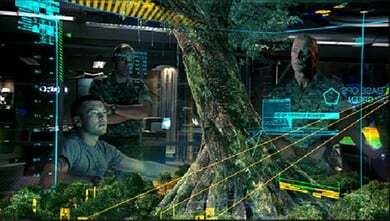 Avatar is being produced by California-based LightStorm Entertainment, which has contracted out much of the CGI (Computer-Generated Imagery) work to Weta Digital in New Zealand. Lightstorm ran an all-digital virtual filming environment with performance capture technology and a Pace/Cameron Fusion 3D Camera System, invented by Avatar director James Cameron and Vincent Pace. This produced scores of information-rich, high-resolution 3D film files from the Los Angeles studio, which had to be rendered into viewable movie components. These files were stored on a clustered Isilon IQ filer setup. An Isilon release says: "The Avatar production generated terabytes of data in various formats, including massive digital files used in creating Avatar's all-digital, virtual filming environment, small metadata and instructional files, still frames for review, and large media files from Avid systems." The terabytes of data were created on a weekly basis and, sometimes, a daily one. Lightstorm could shoot hundreds of takes of any given scene and then access the latest content from the Isilon IQ cluster with its global filesystem. Isilon says that new nodes were added as needed. Well, that's terrific, except that the photo-realistic CGI rendering work was carried out by Weta Digital in New Zealand, which isn't an Isilon customer. Weta used NetApp kit to store the incoming data, then used a huge number of workstations and bladed servers - with 30,000 cores in total - to work on it. The NetApp filers were fitted with up to five 160GB DRAM cache accelerator cards in their controllers, the PAM (Performance Acceleration Modules) caches, to speed file access by the Weta creative people and the servers.